A cesarean (C-section) is a surgical procedure in which unborn puppies are surgically removed from the mother dog’s uterus. It is performed when an animal is having problems while delivering the newborns and is typically an emergency (not an elective) surgery. For certain breeds prone to dystocia (difficult birth), such as English bulldogs, a cesarean may be planned. Sometimes, the dog can also be spayed following the surgical removal of the puppies. This prevents future pregnancies and eliminates the risk of future cesarean surgeries. Determining the need for a cesarean requires a few tests on the dog. Your veterinarian may perform digital vaginal palpation to evaluate maternal pelvic abnormalities, the size of the fetus and to attempt manual removal without surgery. 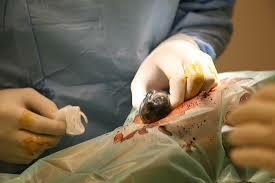 If the puppies are too large or the pelvic canal too narrow for passage, a cesarean is recommended. Abdominal radiographs may also be done to evaluate the size, location, and number of puppies in the uterus. Abdominal ultrasound examination may be done to evaluate the viability of the puppies. If these tests indicate that the puppies are too large or are in distress, an emergency cesarean would be recommended. How is a C-Section Performed on Dogs? Surgery is the final step after medical management has failed to assist the pregnant pet to deliver naturally. The mother must be carefully anesthetized in order to perform surgery safely while minimally affecting the unborn puppies. The surgery is performed through an incision in the dog’s abdomen and the surviving puppies are allowed to nurse normally as soon as the mother is out of surgery. The incision should be monitored daily for signs of excessive redness, swelling, or discharge. Do not allow your dog to lick or chew at the incision, and if this is impossible, you should obtain an “Elizabethan” collar that is placed around the neck to prevent access to the incision. Some vaginal discharge is expected for a few weeks after pregnancy and C-section. The only way to prevent the need for C-section is by avoiding pregnancy in your pet. Early spaying of your animal will make it impossible for her to become pregnant. A C-section is a procedure that is performed in order to retrieve any remaining fetuses from the uterus of a pregnant animal that is unable to deliver them herself. The pregnancy must be very near to the end of the full gestation period in order for the puppies to have a chance of surviving outside the mother. In many cases, the veterinarian will recommend spaying of the mother while removing the fetuses in order to prevent future dystocia, pyometra and other uterine diseases. The uterus is not necessary for milk production. The procedure has few complications associated with it and is well tolerated by most animals. Most C-sections are not planned procedures, as it is unusual for most dogs to have problems delivering. The animal is usually brought to the veterinarian after prolonged straining without delivering, extended duration between deliveries or when a puppy is visibly stuck within the vaginal canal. Occasionally, the puppy may get stuck within the pelvic canal, and the veterinarian may be able to help the puppy out manually. Digital vaginal palpation may also indicate whether the mother has an abnormal pelvic conformation that prevents proper delivery. Radiographs (x-rays) of the abdomen are frequently performed to evaluate the number and size of the remaining fetuses, the size and shape of the mother’s pelvis in relation to the puppies, and may indicate whether the puppies are viable (still alive). Sometimes an abdominal ultrasound examination is done to evaluate the viability of the fetuses. Medical therapy is often attempted before surgery to help the mother deliver the puppies. If the mother has been straining for a long period of time, she may be dehydrated or in shock. Intravenous fluids may be given to rehydrate her and combat the effects of shock. When the mother’s uterus becomes fatigued from excessive straining, injections of oxytocin (a hormone that causes uterine contraction) and/or calcium (an electrolyte necessary for muscle contractions) can increase the force of uterine contraction enough to expel the puppies. It is important that the mother not have an obstruction that is preventing the fetus from exiting or that the puppy is too large to fit through the birth canal before these medical treatments are tried. When it has been determined that medical treatment will not be successful, the mother must be anesthetized for surgery. The anesthetic drugs that are used must be carefully selected so as to perform major abdominal surgery adequately and safely on the mother while minimally depressing the puppies. Drugs used for the induction of anesthesia include combinations of ketamine and Valium®, or propofol and butorphanol. The animal is then given an inhalant gas anesthetic, such as isoflurane, after a breathing tube is placed into her trachea (windpipe). The skin incision is on the midline of animal’s belly. The uterus is gently elevated out of the abdomen and an incision is made into it. All of the remaining puppies are removed from the uterus and passed to a nurse for resuscitation. If the dog is not being spayed, the incision in the uterus is sutured back together after the procedure. The abdomen is flushed with sterile saline to remove any uterine fluids that might have leaked from the uterus during surgery. The incision in the body wall and skin are sutured shut. Frequently, the surgeon will avoid using external skin sutures, especially if there are newborns that will be nursing. In some cases, the dog is spayed following removal of the puppies. Animals can be painful after any abdominal surgery and the mother may be given analgesics if she is excessively uncomfortable. Many drugs can pass into the mother’s milk and into the newborn so most are avoided whenever possible. As soon as the mother is out of the operating room and recovering from anesthesia, the puppies will be allowed to start nursing.